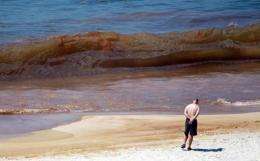 Oil from the Deepwater Horizon oil spill in the Gulf of Mexico, can be seen in the water on Orange Beach, Alabama, in 2010. US oil industry regulators slapped BP, Transocean and Halliburton with regulatory violations notices in what is expected to lead to massive fines associated with the deadly 2010 Gulf of Mexico oil spill. The US government slapped BP, Transocean and Halliburton with citations for violating oil industry regulations in what is expected to lead to massive fines for the deadly 2010 oil spill. The decision to also cite BP's subcontractors could strengthen the British energy giant's legal case for recovering some of the multi-billion dollar costs of the spill from Halliburton, which performed the cement job, and drilling rig owner Transocean. "The issuance today of notices of non-compliance to BP, Transocean and Halliburton makes clear that contractors, like operators, are responsible for properly conducting their deepwater drilling activities and are accountable to the US government and the American public for their conduct," BP said in a statement. "We continue to encourage other parties, including Transocean and Halliburton, to acknowledge their responsibilities in the accident, make changes to help prevent similar accidents in the future, and step forward to fulfill their obligations to Gulf communities." "Halliburton will continue to work with BSEE and is committed to full and open cooperation with regulatory officials," it added in a statement. A Transocean spokesman contacted by AFP noted that "BP agreed to assume full responsibility for the costs and liability of any pollution, contamination and environmental damage caused by hydrocarbons that leaked from the Macondo well." "That contract indemnifies Transocean against all such claims," spokesman Lou Colasuonno said, adding that the Swiss offshore drilling group "intends to appeal the citations." It was the first time that regulators issued the violation notice -- called an Incidents of Non-Compliance (INC) -- directly to a contractor that was not the well's operator. The decision "reflects the severity of the incident and the government's commitment to holding all parties accountable," the agency said in a statement. 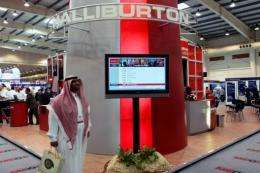 File photo of a Halliburton stand at an expo in Manama, Bahrain. A US government decision to hit Halliburton with citations for violating regulations could strengthen BP's giant's legal case for recovering some of the multi-billion dollar costs of the 2010 Gulf oil spill. It comes after the regulatory agency issued a report in September which spread the blame for the massive oil spill in the Gulf of Mexico, citing a bad cement job, poor management by BP and its subcontractors and risky shortcuts. The findings were largely in line with other investigations into the 2010 disaster. The US Justice Department is also conducting a criminal investigation into the deadly disaster which killed 11 workers aboard Transocean's Deepwater Horizon drilling rig on April 20, 2010. BP -- which leased the rig and was ultimately responsible for operations -- has spent $40.7 billion on the biggest maritime oil spill in history and could still be liable for billions in fines, compensation and restoration costs. The companies have 60 days to respond to the 15 citations issued by the Bureau of Safety and Environmental Enforcement. All three companies were accused of failing to "protect health, safety, property, and the environment by failing to perform all operations in a safe and workmanlike manner," failing to "take measures to prevent unauthorized discharge of pollutants into offshore waters" and failing to "take necessary precautions to keep the well under control at all times." BP and Halliburton were also cited for failing to properly cement the well while BP and Transocean were cited for failing to maintain the blowout preventer. BP was also cited for failing to "conduct an accurate pressure integrity test" and to obtain approval of the temporary well abandonment procedures that were actually used.